LEGO’s are immediately recognized throughout the world as the ubiquitous children’s building blocks. 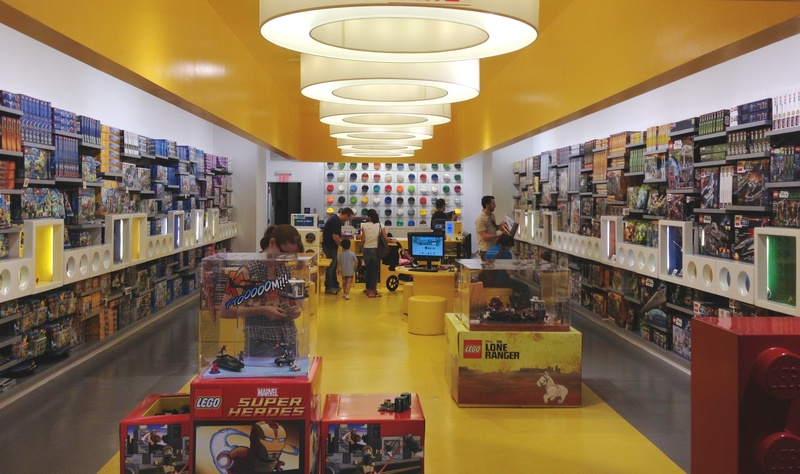 So it’s no surprise that these blocks (bricks as they are known to fans) simple character has been captured in the brands retail stores by the use of their primary color palette, self-serve brick wall bins and super-sized ceiling light fixtures in the iconic shape of the LEGO brick. 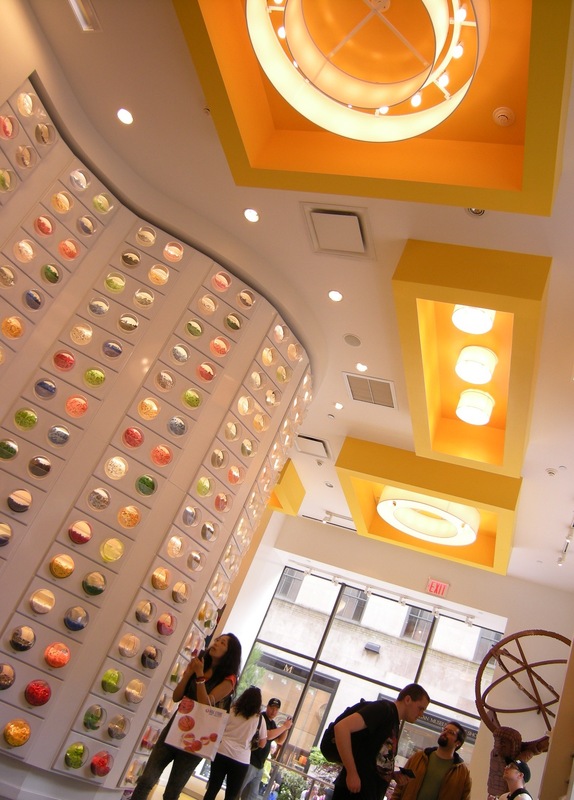 The ceiling brick is held in a yellow frame with the light fixtures, as large white fabric rings, built to emulate the connector ‘stud’ on each of the brick’s. This super sized feature gives the impression that the customer is actually in a large-scale model, almost as if they are themselves Mini-Figures on a stage set of the toy store. This effective branding element scales from the Flagship 5th Avenue store to Main Street stores. While the actual stores vary in size and height the elements work in the smaller Main Street and mall venues. It is important for retailers to have a consistent brand message across its entire footprint and even across channels including internet and mobile sites. LEGO users are passionate about the company, undoubtedly visiting all the stores they can, so if there’s not consistency between the brick ‘n mortar channels and electronic channels customers and fans alike will notice. LEGO has worked to rebuild its product line in the face of strong global competition, shift toward electronic gaming and its own management missteps. A recently published book Brick by Brick reviews how this venerable toy company was able to maintain relevance with its fan base by working with them to drive innovation. Brick ‘n mortar stores are part of the company’s strategy to connect with and stay relevant in today’s children’s lives and it’s committed fan base. Bottom Line: Brand elements should work across a retailers foot print regardless of physical size or prominence of location. Color, texture, merchandise fixtures and branding elements should all scale creating an identity that is easily recognizable to customers.